Academic Computing Services (ACS) is embarking on a new initiative to share the best of our thinking on various academic technology topics with the Vassar faculty. Our Technology White Papers will be brief, informal reports on technologies that we think you’ll find interesting. Each will explain what the technology is, what its potential benefits are, how it’s currently being used in higher education, and how you can get started with it. 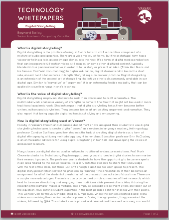 Our inaugural white paper, researched and reported by Senior Academic Computing Consultant Baynard Bailey, is on the topic of digital storytelling. Possible future topics include high performance computing, virtual reality, and microcredentials, or digital badging. Please let us know if these efforts are useful for you, and if there are particular topics that you’d like us to address. This entry was posted in Baynard Bailey, digital storytelling, Steve Taylor, Technology White Paper and tagged #LACOL2017, bailey, baynard, baynard bailey, digital storytelling, Video, video editing by Steve Taylor. Bookmark the permalink.